Other people shouldering Nigeria’s presence in Venice are the curator Adenrele Sonariwo, founder in Lagos of the Rele Gallery and Foundation, associate curator and editor Emmanuel Iduma, a novelist and writer of essays on art and soon a book, expected in 2018, of travel stories, a steering committee of ten: Ike Chioke, Eric Idiahi, Anshu Bahanda, Ade Adekola, Gbenga Oyebode, Kavita Chellaram, Prince Yemisi Shyllon, Olufemi Lijadu, Yvonne Fasinro and Nwakaego Boyo, sixteen sponsoring business enterprises, editorial consultant professor Frank Ugiomoh, project managers Wunika Muyan and Arinola Olowoporoku, communications staffers Bidemi Zakariyau, Tony Usidamen, Ayodeji Rotinwa and book designer Sodeinde Oladapo. 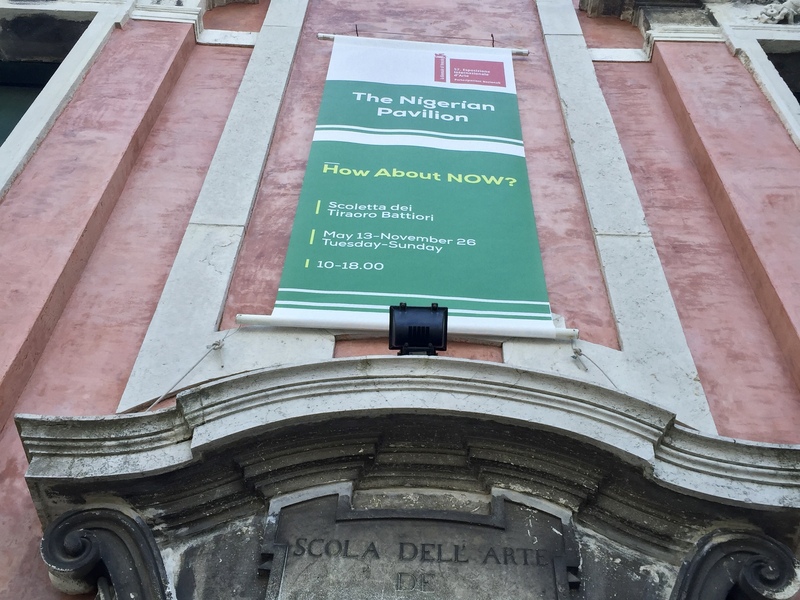 These people made possible: Nigeria in Venice, The Nigerian Pavilion at the 57th Edition of the La Biennale di Venezia. But note also a page with more acknowledgements by the curator and more importantly the names of the authors who interviewed and discussed the artists and their work: Fernando Villarroel, Didi Cheeka, IfeOluwa Nihinola, Yinka Elujoba and Yemisi Aribisala, who contributed an essay: Photograph of the Nigerian. The book includes, I think that was a good idea, a bibliography selected by several Nigerian writers and publishers with titles that may help shape people’s understanding of contemporary Nigerian experience. Selections were made by Irene Nwoye, Rafeeat Aliyu, Ade Adekola, Abubakar Adam Ibrahim, Kola Tubosun, Adebiyi Olusape, Suzanna Ushie, Chike Frankie Edozien, Tunji Olalere, IfeOluwa Nihinola, Helon Habila, Dami Ajayi, Sulaiman Adebowale and Emmanuel Iduma. And then naturally the artists and their work. You may link to them here to see my pictures and read a few word about them.